As some of you know, the building where I live and work is undergoing a major renovation. This week begins the installation of new radiators directly through the area where my Passap kntting machine, yarn supply, computer, and work table are usually located. After several days of packing and moving, I've now relocated to another area in the loft, where I hope to catch up on some work. Since my machine knitting/sewing time has been limited, this is the perfect time to post a few more pictures from my visit this past July to SpinExpo New York, the exposition of international yarn and knit manufacturers. 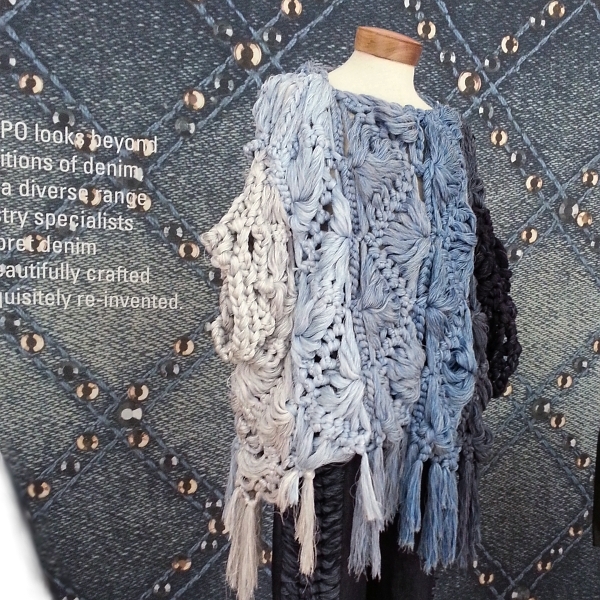 Though the fabrics and fashions exhibited at SpinExpo were mostly knit, there were a variety of other fabrics in the denim concept area. Below is a macramé poncho, created with denim yarns. Besides meeting with a few manufacturers at the show, I was interested in seeing the trends in yarns and knits for Fall/Winter 2015. I saw fluffy yarns in greyscale and tapestry-like knits. Hmmm... I suppose this means my white and grey mohair and pseudo-damask jacquard are on trend. 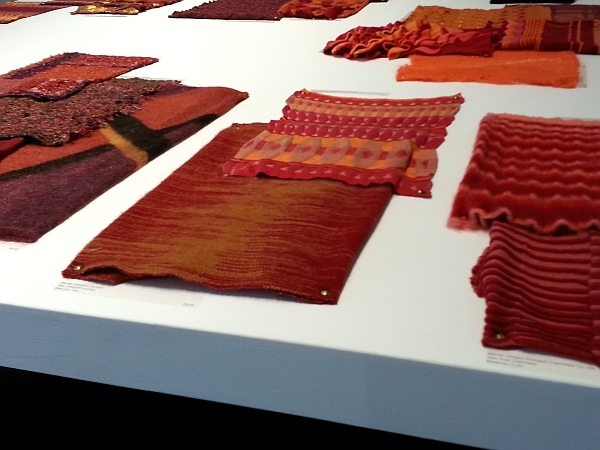 It's always lovely seeing a whole display of swatches in my favorite orange/red/gold color group. One trend I have not explored (and probably won't) is gold leaf on knits. 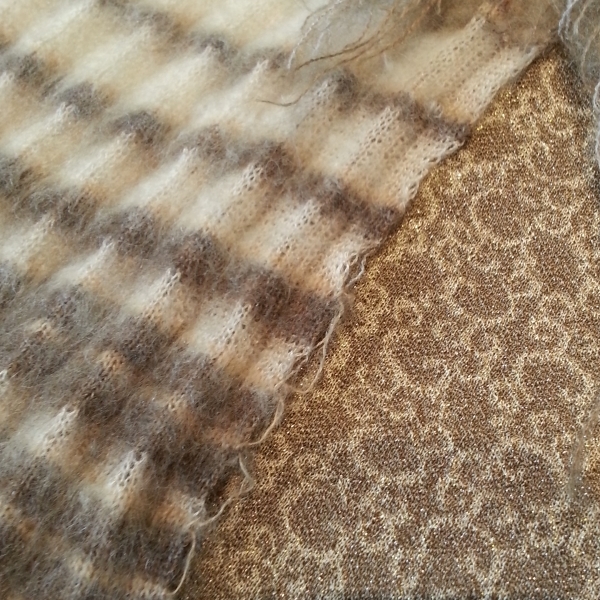 The gold leaf hides much of the texture of the knit and the leaf eventually crumbles off. Ok. If you missed it, please check out my previous post on SpinExpo. 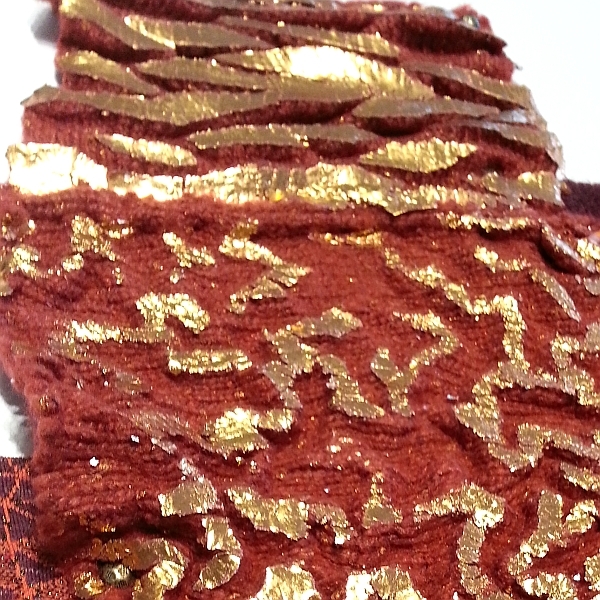 You can see another gold leaf knit and other pics of swatches and fashion from the show. 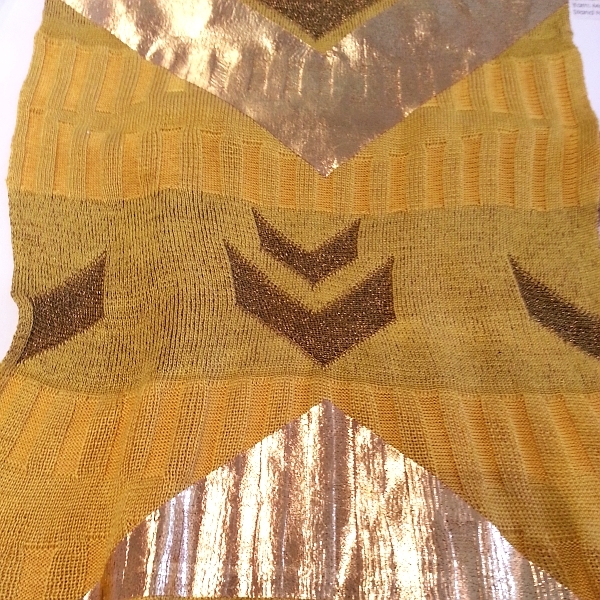 So what are your thoughts on gold leaf fashion knits? And are you ready for the return of macramé? Welcome! I'm really enjoying cutting and sewing my knits. Hope you will too! Woah, some pretty spectacular fabrics there! I'm still on the fence about anything 'gilded' so to speak. It's a fine line between sparkle and glam and full on disco ball.